I would argue that nothing brings a group of strangers closer together quicker than getting drunk together. It will bust through the strongest of language barriers and soon you’ll be the best of buds with people you may have only known for an hour or so. To aid us in our infinite quest for intoxication, we have been gifted the wonderful invention of the ‘Drinking Game’. Drunkards from every corner of the globe have been mixing sport, skill and alcohol since the dawn of time (probably) and so now with the greatest honour I present to you: The Best International Drinking Games. These videos are based on actual drinking games. Some scenarios have been embellished for dramatic purposes. 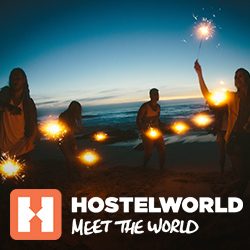 No Hostelworld employees were hurt in the making of these videos, just their dignities. The rules are simple; there is one designated coin, which has the Queen’s head on one side of it. Any player may start this game by successfully placing or throwing the coin into another person’s beverage, sinking it to the bottom. They will then cry, ‘God save the Queen’. The owner of the drink must then proceed to finish their beverage as quickly as possible and therefore save the Queen from drowning. Hurrah! Said person, upon completion, then gains control of the coin and may choose the next target at random to continue the game. You can defend your drinks at any time in any way you see fit. Probably the most Australian game ever, G’day Bruce requires nothing more than your attention. I know, at first, it sounds simple but after a few cold ones it can become quite confusing (trust me!). Sitting in a circle, Player 1 turns to someone next to them and says ‘G’day Bruce’. Player 2 will then reply to Player 1 saying ‘G’day Bruce’. You (hopefully) get the gist of the game. The cycle will then repeat. The idea of this is to not get the order wrong. The player who fails to keep the game flowing, will need to choose another Aussie name for themselves, such as Sheila, shrimponthebarbie, Wallaby, Roo, Dingo or Koala. This, therefore, making the game MUCH more confusing to remember everyone’s name. Requires: Plastic cups a table, plastic sheeting and a hose. This is the ultimate summer game and it’s actually a hybrid of the two classics; Slip n Slide and Flip Cup. This is a race all about speed and skill (start the training now, lads). Kick off the game by dividing players equally into two teams. The first two players, from opposite teams, slide down the slip n slide as fast as they can to the Flip Cup table that is set up at the end. Each player has one cup that is prefilled with their chosen drink. Once the player reaches the table, they must finish their drink as fast as possible. The player must then rest the empty cup on the edge on the table where they must attempt to successfully flip (with their finger) it 180 degrees so that it lands upside down on the table. Once the first person has completed the challenge, the next person in that team can slide, drink and flip. Once all players from one team have completed this, they win! Exercise and alcohol, a perfect balance! Take both of your dice and give them a roll. Each roll will equate to a different rule. If you roll a 3, for instance, a 2+1, you are in Jail (unlucky). You cannot distribute any drinks until you get out of jail. To get out of jail, when it is your turn, you must roll a double (ie. 2+2, 4+4) or someone else must roll a 2+1. They then take your place in jail. While you are in Jail, if any single dice shows a 3, you must drink. If you roll a 9, the person to your left will drink. If you roll a 10, everyone must Cheers (or in French, Santé!) and drink. If you roll an 11, the person to your right must drink. And if you roll a 7, everyone, as quickly as possible, must put their thumbs on their forehead and say ‘Biscuit’. The last person to do so has to drink. Upon rolling any other number, the player must then pass the dice on to the next person. There are a lot of rules for this one, I know, but once you get the hang of it, this game is a real good time! Requires: shot glasses, a strong stomach. Based very loosely on the actual insane game of Russian Roulette. This one won’t actually kill you, however your hangover the next day could make you feel otherwise. Take a group of friends and 6 shot glasses. Fill 5 with water and one with Vodka, these represent the chambers of a gun as most are empty, except one, which contains your ‘bullet’ (aka Vodka). Choose one lucky person to go first, they must select a shot at random and down it. The player must keep their face a straight as possible to not give away whether it was water or Vodka in their shot glass (get those poker faces ready!). However, if the player wishes, they can announce to the group what shot they took. At this point they may lie, tell the truth or stay silent, it’s entirely up to them. The rest of the group must then decide what shot the person took. If they get it right, the player must take another shot again. If the groups decision is wrong, that person is safe and the next player must step up. To increase the intensity of this game you can replace more water with vodka! This a German classic. Starting off as a children’s game, a genius decided to add alcohol to it and created a very tense drinking game. Each player has 3 coins lined up which represent your ‘lives’. As Louie (a man in an aeroplane attached to a pole powered by a motor) rotates around the board he will knock your coins down. You must use a button which is next to your coins to defend your ‘lives’, deflecting Louis up in the air as he rotates to come down and knock off another players coin. The first player to lose all their lives must drink! 2:1 – A Mexican. The highest score you can get. 3:1 – A Scumbag. Doesn’t count as a throw, you must consume your entire drink (sorry!) and roll again. Doubles: For example. 2 +2 is 200, or a 7 + 7 is 700. All others: If you roll a 4 and a 1, your score is 41. If you roll a 3 and 9, you’re your score 93. The highest dice is always read first. The first roller may decide if they want to roll 1, 2 or 3 times in order to try and get a higher score, but they must always count the most recent score as the current. The players afterwards then have the choice to roll the same amount of times as player 1, if they wish. If a player has more rolls to go within their turn, they can choose to only roll one Dice, therefore boosting their odds of rolling for a Mexican. For example, if you roll a 9 and a 1. You can just roll the 9 in the hopes of getting a 2 on your next turn. The person to drink is whoever has the lowest score after one full circle of dice throwing is complete. Requires: 22 red solo cups, an appropriate table about 8ft long, at least 2 ping pong balls and, of course, beer! This classic (and dearly loved) drinking game requires a fairly decent amount of skill and a bit luck. Firstly, start by filling 20 cups half full of beer/ alcoholic beverage of your choice. Then, lay 10 cups in a diamond formation at both ends of the table. Don’t forget to fill 2 cups (1 for each team) with water to rinse the ball in-between throws. Now that your set up is ready, it’s time to divide your mates up into two teams and play a quick round of rock, paper, scissors to decide which team throws first. Ultimately, the goal of the game is for teams to take turns throwing a ping pong ball into the other team’s cups. When the ball lands in a cup you must finish that drink and remove that cup from the table. The first team to sink the ball into all of the other teams’ cups is victorious! (Aka removing all of the opponent’s cups from the table). Some find themselves having an exponential relationship with beer and aiming skills, while others start strong and finish weak. Either way, good luck! There are a few variations of this game, such as ‘bouncing’ the ball into a cup means drink x2 cups etc. So, it’s always good to go over the rules with your hostel mates before you start. These rules are not a game as such but rather a set of guidelines that can be applied during any of the above games. Should you choose to adopt them, anyone who breaks the rule(s) must drink. So, there you have the ultimate drinking games from around the world! Go on now, gather your mates, drink responsibly and …have fun.Cheers! Sláinte! Salute! Proost! Salud! Skál! The post Best drinking games from around the world appeared first on Hostelworld Blog. 15 cheap places to go in May!